Randy Elrod. 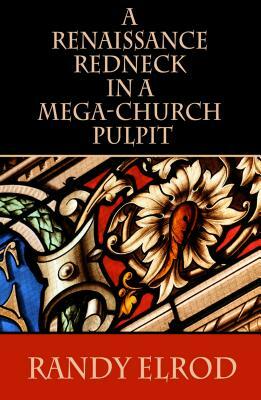 A Renaissance Redneck in a Mega-Church Pulpit. Nashville, TN: Clovercroft, 2014. 238 pp. $14.95. Growing up in New Jersey, my first impression of that strange terra incognita known as Appalachia came from my high school guidance counselor. Do well in your classes and on your SATs, he’d warn us, or you’ll have to spend the next four years at Creampuff U in the back hills of Kentucky. About the same time, I was introduced to Deliverance, a terrifying film that convinced me Appalachia wasn’t only a preserve of ignorance but of violence as well. Not a place for the squeamish or for those who lacked a taste for moonshine. When I moved to Texas and became more involved in the evangelical world, my mental landscape of Appalachia shifted to incorporate stereotypical images of fiery Pentecostal revivals, oily faith healers, and half-crazed snake handlers. Though I’ve never doubted the continued existence and manifestation of the spiritual gifts of tongues, prophecy, and healing, the stories I heard about charismatic worship in Mississippi, Alabama, and Tennessee led me to wonder if any good could come out of such seemingly anti-intellectual, unrestrained emotionalism. Although Randy Elrod’s entertaining and deeply moving autobiography by no means dispels all these stereotypes, he qualifies and nuances them in such a way that the soul-crushing privation under the emotional outburst, the spiritual passion under the charismatic chaos, and the fierce family loyalty under the unhealthy insularity emerge with the force of a revelation. Elrod is neither a historian nor a sociologist, but in A Renaissance Redneck in a Mega-Church Pulpit he makes Appalachia come alive in a way no social scientist could. In the place of statistics, abstract labels, and reductive theories, Elrod presents us with real people living real lives. Elrod’s story is a familiar American one of rags to riches: backwoods Tennessee boy beats all the odds to complete a college education (he was the first in his family to graduate high school), become the music and arts pastor for two of the most influential megachurches in America, and travel all over the world. It also tells the equally American story of celebrity burnout and the need to find emotional and spiritual healing. Along the way, Elrod offers insight into how autocratic pastors can crush creative staff members (for example, by demanding strict loyalty and obedience without regard to conscience, or by forcing them to do hospital visits they aren’t emotionally equipped to handle) and how needy music ministers can pervert a godly desire for approval into a craving for applause that robs them of a sense of themselves and leaves them vulnerable to the whims of the crowd. “Spiritual fame is a fleeting and fickle thing,” Elrod explains. “One mistake and you are turned out to pasture like a diviner’s donkey” (78). But that is only half the story. While helping us to understand the sources of Appalachian emotionalism, Elrod opens our eyes to something else damaging to the soul: fundamentalist legalism. The revivals might offer a temporary escape from the pain and dreariness of life, but the major defense strategy practiced by those in the backwoods of Tennessee consists in a life dominated by inflexible, authoritarian rules meant to build a protective wall around families, churches, and communities. Elrod tells some memorable stories about his failure to protect his growing locks of hair from the fundamentalist insistence on buzz cuts for boys. The stories are funny and told with style, but they build up to a “moral” that makes the laughter stick in the throat: “Much later in life, I learned that the shaving of one’s head is a primitive method of subjugation. It is an act designed to be degrading and is a psychological tool to break down resistance and instill obedience” (38). The don’ts of fundamentalism are all about control; they may teach humility and self-sacrifice, but they do so by breaking the spirit. In one of the saddest lines in the book, Elrod tells us that his father, like so many others in his family, “got the innocence spanked and churched right out of him by religious admonition” (40). Thankfully for Elrod, his mother fought hard to prevent the same death of personality from sapping the life out of her son. “I think religion has destroyed many people . . . like my dad,” Elrod explains. “Chains cease to be needed after the spirit has gone out of a prisoner. And somehow, innately, my mom fought to keep that from happening to me. She determined to save those microscopic atoms in me that were truly me” (41). Joy, creativity, and personal identity are all fragile things; they can easily be twisted and led astray by unthinking emotionalism, but they are killed outright by legalistic repression. That Elrod was, in the end, able to reassemble the broken shards of his spirit through good counseling, the support of family and friends, and the ministry of the Holy Spirit is a miraculous thing. That he was able to write so perceptively about his childhood without bitterness or reproach is perhaps even more miraculous. Rest assured, Elrod does not play the Freudian game of blaming his poor choices on his parents. To the contrary, he treats his father with the utmost respect and even has a good word to say about his hickory-switch-toting grandmother who, whenever she flayed his hide unfairly, would console herself with the knowledge that sooner or later her grandson would do something deserving of a whipping. By the end of the book we learn, sadly, that Elrod, broken by his struggles with autocratic pastors and his own desperate need for approval, fell into sin and was forced to reassess his life, his ministry, and his choices. Still, rather than shift the blame, he affirms the power of the Spirit to change us from within. As such, he offers both a cautionary tale and a celebration of God’s grace. Though he eventually stepped away from his position as music and arts pastor, Elrod continued what he came to see as his true calling: the nurturing of creative Christians like himself through an annual, nondenominational conference that seeks to use the arts to build bridges and, in his own phrasing, to unite passion with precision. Elrod’s name may not be a household word, and his upbringing will seem foreign (well, very foreign) to most readers. But the insights he offers into the dangers of emotionalism, legalism, and authoritarianism in close-knit communities and churches transcends Appalachian and charismatic culture and merits close reflection by all those who care about the nurture of souls—whether those souls be in the pulpit, choir loft, or pew. Louis Markos, professor in English and scholar in residence at Houston Baptist University, holds the Robert H. Ray Chair in Humanities. His 18 books include From Achilles to Christ (IVP), Apologetics for the 21st Century (Crossway), and Atheism on Trial (Harvest), which devotes a chapter to analyzing the Christian and non-Christian elements of Marcus Aurelius’s Meditations.